You can download v3345 from this page. This driver supports full OpenGL 4.2 on Intel Haswell. 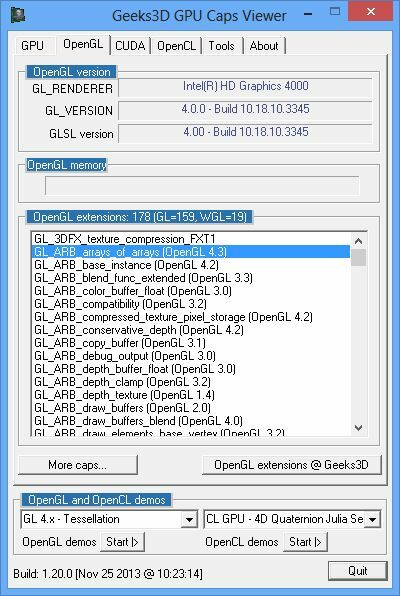 A list of extensions needed to get OpenGL 4.1 / 4.2 / 4.3 for this driver would be practical. Would give a good idea how much needs to be done before the newer versions are supported. Intel HD graphics… what a joke. If you believe that you can play decently @ 24 FPS on an Intel CPU, even Haswell, well I you must tell you that you are a MORON. GTFO Intel! I can tell you this much, I have a OpenGL based screensaver and ran choppy before(Really Slick Screen Savers) and with this new driver update smooth as butter! So there must have been some optimizations or bug fixes along with extension additions. So good job Intel!! keep improving OpenGL!!! Well I never used to take intel seriously with graphics but with Iris and the new drivers they are not such a joke anymore. There’s some compute power in there somewhere me boy and I’m going to exploit it I tell yer. Intel 10.18.10.3412 drivers for Haswell and Ivy Bridge. Intel 10.18.10.3496 drivers for Ivy Bridge & Haswell released.